From 2007- 2009 I was Manager and co-curator (alongside Paul Domela) of Site Gallery. 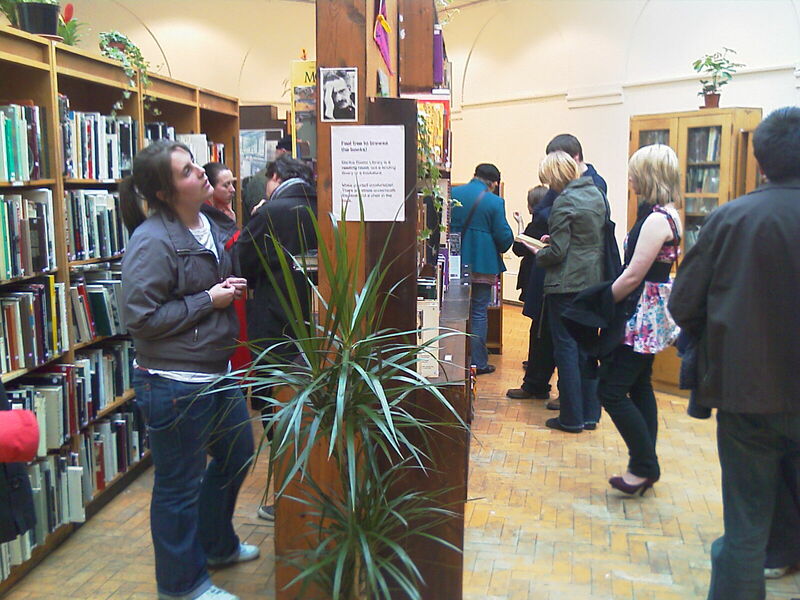 Site Gallery was initially collaboration between Liverpool School of Art and Design, Liverpool Biennial and the Albert Dock Company. By 2008, Site Gallery had become a vehicle for developing and fostering links between Liverpool John Moores University/School of Art and Design and a range of artist, designers, architects and musicians. Since its opening in February 2007, Site Gallery attracted over 28,000 visitors to its shows on National and International Art and Design. 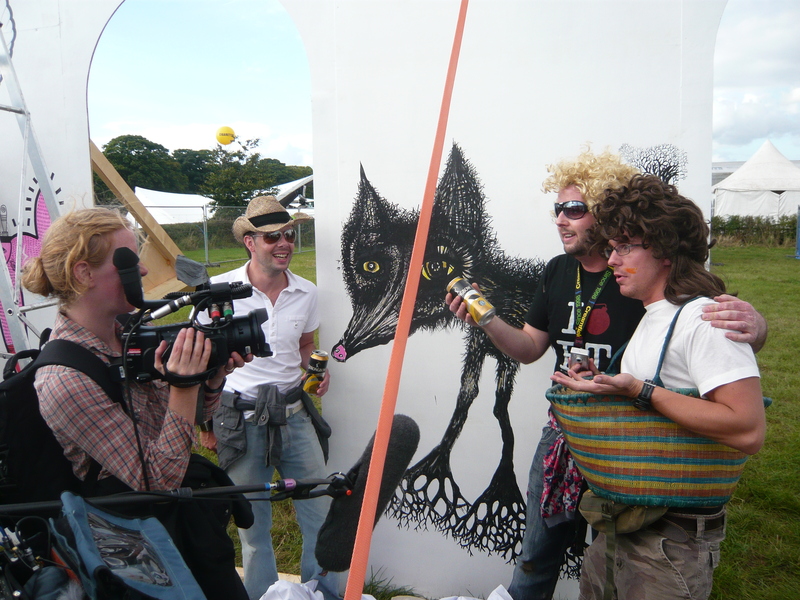 The collaboration between Site Gallery, Grizedale Arts, FACT and Cream for ‘CreamTVfields’ 2008 saw a temporary pop up internet TV channel receive over 35,000 new hits over the two day period of the Creamfields Dance Festival. Pehaps most notably, Site Gallery collaborated with Liverpool Biennial to bring the Martha Rosler Library to Liverpool School of Art and Design in the summer of 2008.Site Gallery also collaborated with Microzine, Cream, FACT, Tate Liverpool, Cube Gallery Manchester, RENEW Rooms Liverpool and the Arts Council of Great Britain. Initially a 1 year project, Site gallery became an opportunity to begin thinking through some of the ideas, themes and issues which later informed my participation in and collaborations with Static Gallery, Grizedale Arts, The Autonomy Project and the Uses of Art Project. ‘Darling’: 5 March – 4 April 2009. This show, by the London based gallery ‘The Centre of Attention’ saw LJMU staff, students and the general public participate in the public re-making of the 1960’s Oscar winning feature film ‘Darling’ in The Academy, Liverpool School of Art and Design, FACT (The Foundation for Art and Creative Technology) and Liverpool City Centre. Curated and Produced by John Byrne, in Association with ‘The Centre of Attention’ and ‘Abandon Normal Devices Festival of New Cinema And Digital Culture’. A completed version of the Film was Premiered during the Abandon Normal Devices Festival at the FACT Centre Cinema on October 25 2009. ‘CreamTVfilels’, Curated and Produced by John Byrne, Adam Sutherland (Director Grizedale Arts) and Alistair Hudson (Deputy Director Grizedale Arts). CreamTVfields saw a truly unique online/offline installation/art event take place at the International Creamfields Dance Festival Daresbury Estate over the weekend of August 28 – 29, 2009. This event saw a collaboration between Liverpool School of Art and Design, Grizedale Arts, Cream, FACT and The Arts Council North West celebrate the 10th Anniversary of the Creamfields Dance Festival by bringing together a portable TV/Digital Editing Studio, a Sculpture/installation by renowned artist Pablo Bronstien, 12 young Filmmakers and 20 Graffiti Artists from Merseyside to produce a 48 hour long temporary online TV channel (called ‘CreamTVfileds’) via FACT’s online TV facility. Creamfields was attended by over 50,000 young dance and rave fanatics and the CreamTVfileds online channel received over 35,000 hits during the festival weekend. The Project also saw screenings of video artworks by Juno Projects, Marcus Coats, Nathaniel Mellors, Gestroom and Bedwyr William’s screened online and on the Creamfileds Main Stage Screen. CreamTVfields was supported by Arts Council England, Liverpool John Mores University/Liverpool School of Art and Design, ACME and FACT. From April 12 – 14 June 2008 the internationally renowned ‘Martha Rosler Library’- a collection of books, videos, and works by the leading contemporary artist ‘Martha Rosler’- was hosted in Liverpool School of Art and Design’s Hope St. Gallery. This show was curated by John Byrne and Paul Domela (Deputy Director Liverpool Biennial)in collaboration with e-Flux New York and Stills Gallery Edinburgh. The ‘Martha Rosler Library’ was also shown in Stills Gallery, Edinburgh, The Institute National d’Hisorie de l’art, Paris, e-Flux New York and the Frankfurter Kunstverein, Frankfurt. From November 17th to January 26th, Site Gallery will host part of the ‘Shrinking Cities’ show that will be coming to Liverpool and Manchester. Other venues include Cube Gallery Manchester and RENEW rooms Liverpool. Site will host over 20 works by international artists including ‘Superflex’, Leo Fitzmaurice, Neville Gaby and Pierre Huyghe (who had a major retrospective at Tate Britain in 2006). As well as project managing this, Byrne has also curated ‘Polarization’, a collaborative work between Dr. Robert MacDonald (Reader in Architecture), Patricia MacKinnon-Day (Reader in Site Specific Art), Johathan Hitchen (Graphics), Caspar Jones (Interior Design) and Sarah Moriarty (Product Design). Their collaborative installation will be shown in RENW Rooms (the official RIBA site in Liverpool) as part of the ‘Shrinking Cities’ show. Byrne has also co-curated the ‘Shrinking Cities Side Programme’ for this event which is a series of events, web casts, seminars, debates and temporary art works that will happen in Liverpool and Manchester during the course of the show. The ‘Shrinking Cites Side Show’ is a collaboration between Site (LJMU School of Art and Design), Liverpool Biennial, Liverpool Tate, FACT, RENEW Rooms (RIBA), Cube (Manchester), Albert Dock Company (Liverpool), and the Federal German Government. A show of Radical Textiles (supported by the Arts Council of Great Britain). Artist included in this show include were Nina Edge, Helen Thompson, Vanessa Cuthbert, Tom Sykes and Tim Fielding. This show also included a series of public talks and seminars held by Nina Edge. In September 2007, Site also collaborated through this show on the ‘Late at Tate’ event, curated by Jean Tormey, Curator of Public Events, Liverpool Tate. This special ‘Late at Tate’ event marked the opening of ‘The Turner Prize’ at Liverpool Tate’. An exhibition with the Superclub Cream. This show, assistant curated by James Barton, CEO of Cream, enabled artists, designers and Cream fans all over the world to submit re-designs of the Cream logo and their own music videos to the show via two online competitions ‘Customise Cream’ and ‘Cream Video’. Both Competitions were fully endorsed by Cream and appeared on the official Cream website and MySpace. The show at Site included international work by Arash Moori and Esther Manos, Concrete Films, Daniella Orsini, Gerard Doolan, Helen Lovett, Mark McNulty, Robert May, Sam Skinner and Tim Fielding. Site also curated Naomi Kahawagi, an artist who DJs with Gramophone records, to present a live set at ‘Creamfields’ in August 2007. Also in August 2007 Site also collaborated through this show on the ‘Late at Tate’ event, curated by Jean Tormey, Curator of Public Events, Liverpool Tate. An exhibition by Merci. Artists will include: Nathan Burr, Jan Erichsen, Benjamin Fallon, Nicola Fitzsimmons, Eugenia Ivanissevich, Tim Jukes, Naomi Kashiwagi, Paul Luckraft, Herve Paraponaris, Ben Parry, Alexander Pearl, Angelo Picozzi, Mark Selby, David Snoo Wilson. A show by Design Group Burn: Burn are JMU Alumni who have set up a successful International Design agency. The show consisted of a sculpture which was built, over the duration of the show, by members of the public. An exhibition with Microzine. This exhibition was assistant curated by Chris Lee, Director of Microzine (London and Liverpool) and Creative Director of DKNY New York. The show consisted of white products (including a Mini Cooper) that were customised in black by students of Liverpool John Moores University’s School of Art and Design. An exhibition by the Royal Standard. Artists and artworks included: Johnny DeVeras ‘Meridian/Equator’, Leo Fitzmaurice ‘Cardboard City’, Low Profile ‘Commuter Karaoke’, Minou Norouzi ‘Imago’. Works for previous Liverpool Biennials. Artists and art works included ‘Happy Together’ by Choi Jeong Hwa (Liverpool Biennial 2004), Erwin Wurm ‘One Minute Sculptures’ (Liverpool Biennial 1999), Neil Cummings and Marysia Lewandowska ‘The Commons’ (Liverpool Biennial 2004), Nina Fischer and Maroan el Sani ‘Sniper, Berlin-Mitte on wood and wallpaper, Liverpool 1’ (Liverpool Biennial 1999).